Streamtime Classic and Xero integration is usually trouble free, but occasionally there are times when order or invoice exports to Xero fail with errors. This article assumes you have correctly followed the steps in our Streamtime Xero Integration - Setup article. We recommend using to the latest version of Streamtime when integrating and exporting to Xero. In Streamtime 13.6 and above, there's a dialog box that displays the status of each invoice as it's exported to Xero. 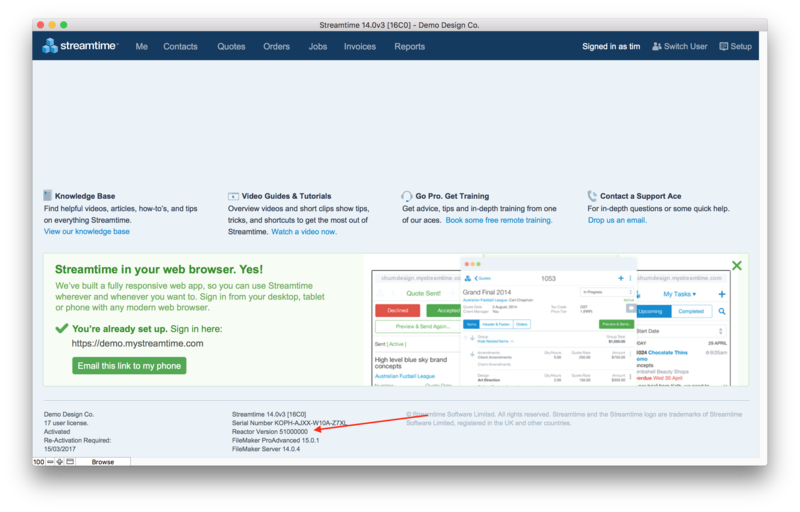 If an invoice fails to export, note the invoice number and use the guides below to alter the invoice in Streamtime and try the export again. If you receive this error, it means that there is no supplier invoice number included on the order. Xero requires an invoice reference number to be attached to your orders when exporting from Streamtime Classic. To resolve the issue, just enter the purchase order invoice's reference number into the Sup Invoice No field in the order details, and try exporting again. This error indicates that there is no Expense Code attached to one, or some, of the items included on your order. All items in Streamtime require a Sales and/or Expense Code, which correspond with an Account Code in Xero, in order to be exported successfully. When exporting orders, Xero will match the Expense Code to an existing Xero Account Code. When exporting invoices, Xero will match the Sales Code to an existing Xero Account Code. To resolve the issue, you'll need to check the order items within the Cost Matrix. Once you have located the item that is missing an Expense Code, just enter in the corresponding Account Code from Xero for that item, and try exporting again. Note: If you receive this error code, it's likely that you also received the error code 'The TaxType field is mandatory'. Both these errors can be resolved by following the steps above. If you receive this error code, it's likely that you also received the error code 'Account code must be specified'. Both these errors can be resolved by following the steps in the above fix for Export Failed: Account code must be specified. This error is usually caused by Invoice line items in Streamtime that don't contain a quantity or an invoice amount. The most common example is when a line in Streamtime invoice is used as a heading. Xero requires every invoice line item to have a Quantity and an Invoice rate; they are used in Xero to calculate a total amount for each line (even if it's a $0). Another possible cause is when the description of the invoice line ends with a return to create blank spaces in the print out. Just remove the returns to fix this and try exporting again. Note: Streamtime 13 and above does not require these items to be completed on your Quotes and Invoices; if you're integrating with Xero, it's best to have all fields completed. This error indicates that there's a mismatch between the line amount total calculation in Streamtime and Xero. It's due to a currency rounding error in Xero. Xero will reject invoices exported from Streamtime that contain line items with more than 2 decimal places. To resolve this, change the Streamtime currency from 7 to 2 decimal places in the Setup > System Setup > Currency and Tax. Note: Streamtime will recommend setting the Currency Accuracy to 2 decimal places when selecting Xero as the default accounts package. Error: This document cannot be edited as it has a payment or credit note allocated to it. This error indicates that the exported invoice has already been entered in Xero and has been marked as paid or part paid. Once an invoice has been marked as paid in Xero, it's not able to be amended/exported again. Confirm the invoice is already in Xero. Remove the invoice from the list of invoices by changing the Invoice status to Exported so it's not exported next time. Tip - To remove an invoice from a list, select it and choose 'Omit Record' from the Invoice - Quick Keys menu or enter Cmnd 6. Streamtime will export any invoices contained in the Invoice list. Make sure you only export invoices that have been sent to your clients by selecting the 'Show invoiced' button. If you are encountering this error while exporting a purchase order to Xero, it is most likely because the supplier invoice number in Streamtime is being pushed to the Xero PO reference field and there is already another document with that exact same reference. Try changing the supplier invoice number by adding a code in front or behind the supplier invoice number and try again. Add some details here or delete the line item and try the export again. This is a fairly self explanatory error. Xero does not support the import of invoices where the total is less than $0. Credit notes should be created in Xero. Error: Invoice not of valid status for modification. This error appears when there is an Invoice in Xero with that same Invoice number that has been marked as VOID. Due to this VOID status, Streamtime cannot push this same invoice number into Xero. We would suggest duplicating the Invoice in Streamtime and deleting the 'original' and then trying your export again. 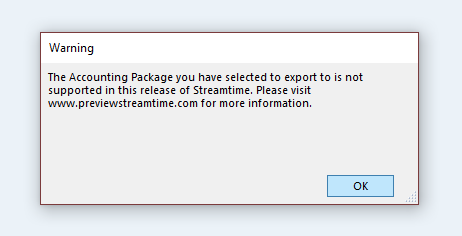 The Accounting Package you have selected to export to is not supported in this release of Streamtime. This error indicates that you have selected an unsupported Accounts Package in your Accounts Integration in the Setup area. In this example, the header 'Xero' was selected instead of the Xero application itself. This error may indicate that you do not have the Reactor File installed on your machine. If you go to the home screen by clicking on the Streamtime logo in the top left and making sure there is number next to the Reactor Version. If there is not you will need to contact us to upgrade your Streamtime. Can't see your Error Code here?